Inspired? 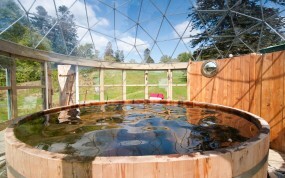 What project would you use a dome for? Maximise your outdoor area - for hotels, B&B's and leisure facilities looking for additional space or planning a new outdoor leisure area, our elegant domes create a striking design statement that is also functional and cost-effective. Quality, bespoke corporate exhibition stands – our domes or spheres are perfect for transforming exhibitions into a unique, attention-grabbing and modern space. 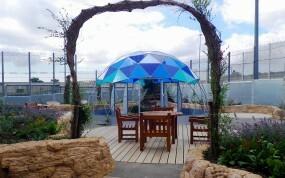 Our glasshouses create ideal biodomes to replicate different environments from a lush jungles to an arid deserts. 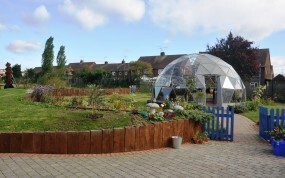 A unique community feature and multi-functional space – with their multitude of uses and ability to be a striking centre-piece, covered shelter, and functional space for urban agriculture our domes are ideal for the whole community to share. 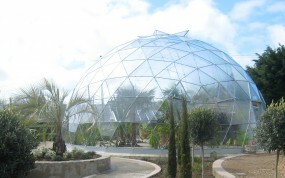 An extra dimension to customer experience – our geodesic domes are proving the ideal solution to enhancing the experience of visitors and customers to key attractions, garden centres, galleries, museums and hotels. 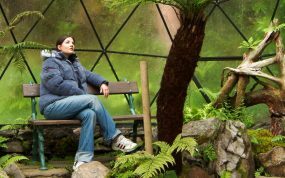 Enhancing the healing environment – with their natural light and tranquil, ‘back to nature’ feeling, our domes are providing an innovative approach to therapeutic and rehabilitation activities in the wellbeing and healthcare sector. 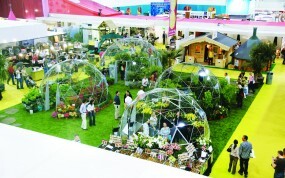 Solardome provided the "Flower Domes" feature stand for Grand Designs Live with four of their unique domes housing a buzzing flower market.